Some of us are organization crazy, others of us hate it....but as a business it is essential to get your projects in one place so that you can manage deadlines and track your time. We built Intervals after trying just about every "project management solution" "timesheet solution" "ticketing system" and "bug tracker" out there. Nothing worked for us so we created Intervals. 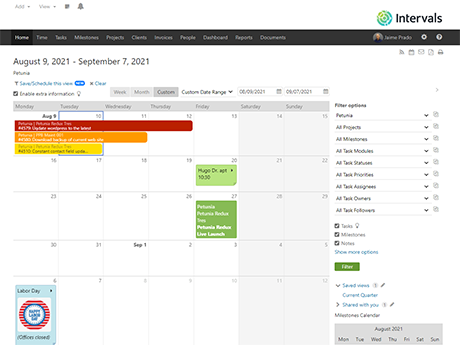 Intervals is a fast and efficient hosted project management tool that provides one place to do all of your work, keep all of your notes and track all of your time. The best part, you just get used to putting everything into Intervals and then one day you have a bunch of data and stumble into the reports section. The reports section has everything we need to know about the health of our business. Which clients are we working on? Which projects are we working on? What's our average hourly rate? Do we need to bill someone? Do we need to hire someone? Intervals is a web based task & time tracking application. When we first started developing Intervals we called it an "accountability system". Accountability for you to your clients and the contracts you are fulfilling and accountability from your workers to you. Intervals is a great way to get a grasp of what you are working on and how long it is taking.